This month I came across this page listing several Sheffield Rules. More than just the four I’ve used so far. So I was able to update the different rules and the short history of the Sheffield FA Rules. Here it shall be presented now a little bit more detailed the rules from Sheffield, but of course not as detailed as several books treat it, which considers Sheffield FC in its beginnings. It is the elaboration of my comparison. My first mistake that caught my eye in the analysis was that Sheffield FA was not founded at the same time as Sheffield FC, but in 1867, nine years later. So after the Football Association was founded. The latter existed mainly outside London football clubs, but not only London clubs were involved in the founding, but also, for example, a representative of Sheffield FC was present. Sheffield FC was founded on 24th October 1857 by solicitor Nathaniel Creswick (1831-1917) and wine merchant William Prest (1832-1885). Both were cricketers, which was traditionally played in the summer. Football, on the other hand, had already been introduced as a winter game at the public schools. And in order to be able to continue sport during the winter months, both set up a football club, which was mainly oriented towards football without running with the ball (literally: „picking up the ball“ as this was the crucially difference to rugby). Creswick became the coach, Prest prepared the code. At the beginning of 1858 there was a first draft for the code. It contained rules on the kick-off (law 1), goal kick (law 2), permitted and unlawful playing the ball and opposite players (laws 3 to 9), how a goal is scored (law 10), throw-in (law 11) and player’s equipment (law 12). Details about the field, measures of the goal, number of players, toss and change of ends, offside, corner kick and umpires or a referee were missing. While laws 1, 2 10 and 11 do not differ remarkably from today’s use, the laws about allowed and illegal play are different. First of all, the handling game: The Fair Catch (law 3) was allowed, i.e. catching the ball from the air that has not yet touched the ground. In this draft it is noted that the ball must come from the opponent’s body. It was forbidden to hit and charge (law 6), to pick up the ball with the hands – both lying (law 8) and rolling (law 9). Only in this draft there is a handling besides the fair catch allowed: A ball bouncing on the ground could be picked up (but not hit or pushed). It is not mentioned whether the play was continued by an free kick like in the Fair Catch. The opponent could not be pushed, nor kicked (law 5), nor held, not charged (law 7), unless there was a place kick. You also were allowed to push your opponent hard on the shot (law 4). At the same time, the law gives the charging player the tip to take himself back until his opponent has touched the ball with his foot. The allowed picking up of a bouncing ball and the charging of an opponent from the place kick are the unexpected laws of this draft. Before the Sheffield FC Rules were published in 1858, there was one last draft that differed from the published rules only in one point: one laws was deleted. But compared to the first draft there were further differences. The last draft and the rules published in 1858 also contained regulation on the kick-off (law 1), goal kick (law 2), allowed and unlawful treatment of the ball and opponents (laws 3 to 8 and 9 respectively), how a goal is scored (law 9 and 10 respectively), throw-in (law 10 and 11 respectively) and player’s equipment (law 11 and 12 respectively). So let’s get straight to the permitted and forbidden behaviour, because nothing relevant was changed in the other laws. It was forbidden to hold the ball or to pick it up from the ground. A ban for hitting the ball or picking up a jumping ball is missing as well as a permit for this. Permitted handling game was still the Fair Catch (now you could always catch the ball, even if it came from the other player), but it was the only one. In the game against the opponent now holding, tripping and charging were not allowed, kicks were not thematized. The strong charging at the place shot and now additionally the pushing were allowed. So, the game developed during the drafts and became more combatively, but football without running and hacking and no mixed game (a mix of rugby and soccer). At the annual general meeting in Sheffield there were always suggestions for changes to the rules. For the nine years between 1858 and 1867 I still have the rules of 1862 for comparison. The first set of rules was drawn up on 28.10.1858 in Adelphi Hotel (today’s address: 55, Norfolk Street, Sheffield) and published in 1859, the 1862 version on 30.01.1862 in Falcon Inn, 13, Flatstreet, Sheffield (publication time unknown). At first glance it is noticeable that the number of laws has increased from 1858 to 1862. Six laws were completely new: rouge (laws 11-12, 14), offside (law 13) and changing ends (laws 15) and information about goal measures and rouge flags (law 16). It was fixed that all free kicks remained as indirect free kicks (law 10), the throw-in did not belong to the team that had kicked him out, but touched him there afterwards and that in addition to hitting the ball, and hitting the ball and touching it with arm or hand was now also forbidden (law 8). The offside regulation was still very general in 1862: Anyone standing behind the goalposts during the shot must not touch the ball, as it is offside, nothing more. After every goal or a goalless first half, the ends were changed. The goal was 12×9 ft in size and was added by rouge flags, 12 ft from each goalpost. The rouge flag belonged to a regulation introduced in 1862 which was intended to reduce the number of draws: The Rouge. Rule 11 describes how a rouge is achieved.1)Cf. Sheffield Football Club. In: Sheffield Daily Telegraph, 31.01.1862, p. 2: „The most important alteration is the adoption of ‚rouges,'[!] which will have the effect of preventing matches to result in ‚draws‘.“. A Rouge is obtained when a [attacking] player first touches the ball after it has been kicked between the Rouge flags. If a rouge has been obtained, a player from the defending team must stand 6 ft in front of the goalposts. Rule 12 describes, how no rouge is scored. No rouge is obtained if a player of the defending team touches the ball first. In this case there is a goal kick as described in rule 2. So only if a game ended in a draw, the number of rouge decided on the winner of the game. If these were also undecided, the winner was chosen with further options as a toss for example. These further options weren’t part of the law. The last law in the 1862 version, the 17th one, concerned the colour of the jersey and shorts, again. Since almost all the games took place within the club (for example, workers against employees or those born in the first half of the year against those born in the second half of the year), there was a requirement for all members to have a red and a blue flannel cap. This allowed a distinction to be made between the teams, which varied in composition. Rarely, there were matches against other teams. The first one was on December 26, 1860, Boxing Day, against the newly founded club from neighbouring Hallam. For each club 16 were playing. The number of players was never fixed in the Sheffield Rules. The Sheffield FA included Sheffield FC and all twelve association football clubs from Sheffield and the surrounding area that took part in the Youdan Cup (16.02.-09.03.1867). Sir John Charles Clegg (1850-1937) and Charles Stokes (1850-1937), both 17 years old, founded the Sheffield and Hallamshire FA, short Sheffield FA, as a regional association in March 1867. Heeley FC (1862-1898)2)Founded by parish Heeley Christchurch. Heeley is district of Sheffield. Norfolk FC (1861-1879)3)( Name in honor of Duke of Norfolk on whose land they played. Sir John Charles Clegg, knighted in 1927, became the first chairman, later he was called the „Napoleon of Football“ due to his ambitions. Solicitor Harry Walker Chambers (1842-1907, 25 years old) the first president. Chambers was joined in 1869 by the stationer John Charles Shaw (1834-1918, 33 years old), who was president of the association until 1882. Chambers already represented Sheffield FC in the founding of the Football Association and Shaw has tried to form a national code with Charles Alcock as early as 1863. Their joint efforts continued. The rules of the Sheffield FA combined the Sheffield FC Rules with the FA Rules. Mainly the measuring instrument manufacturer William Chesterman (1837-1930, 31 years old) as well as Prest and Creswick were involved in the founding of Sheffield FC and now in the creation of the Sheffield FA Rules. 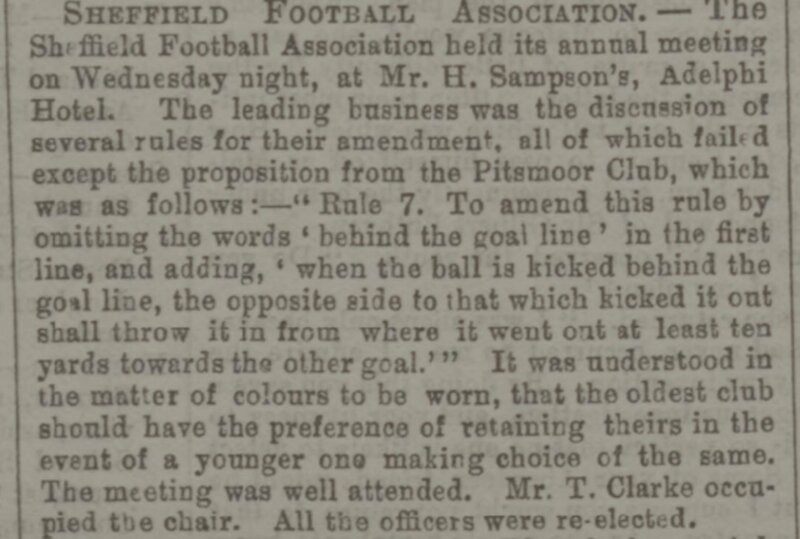 The rules were adopted by the „First set of laws of the Sheffield Football Association, adopted at a meeting held at the Adelphi Hotel, March 6th, 1867. Based on the 1867 laws of the Football Association“4)All other annual general meetings of the association until 1867 took place in this hotel. Besides the chairman, president, vice-president, secretary and treasurer there was a committee with representatives of the different member clubs. Not only the number of rules in the rules changed from 1862 to 1867 (from 17 to 14 rules), also the only rules that have not been deleted or changed are the rules for changing ends and that the number of goals outweighs the number of rouge goals. Everything else has at least been changed, if not even reinstated. The laws about kick-off, fair catch and rouge, strong charging, player’s equipment and handling the ball and unlawful game have been deleted without replacement. Obsolete by the new law 9 became the restriction that the ball could not be picked up with hands and to the player’s equipment. The first rules were decided on 6. March 1867 decided and regulated the dimensions of the playing field, goals and the location of the rouge flags (law 1), the choice of the sides (law 2), the change of ends (law 3), how a goal is scored (law 4), the throw-in (law 5), the offside and who the goalkeeper is (law 6), the predecessor of the corner kick (law 7), the ratio of goals and rouge (law 8), handling the ball (laws 9, 12 and 13), how no goal may be scored (law 10), unfair play (law 11) and provisions on players‘ boots (law14). In addition, there were the definitions of various terms mentioned in the rules: Place kick, free kick, hacking, tripping, knocking on, holding and touching out of the court. In 1868, the definition of fair catch was added. From the Sheffield Rules I can compare the rules of March and October 1867, 1868, 1869, 1871, 1875 and 1876. Over this time there are only few changes left. The biggest changes were the prohibition of the Fair Catch (1871), the change from the rouge to the corner kick as we have it today as well as the introduction of umpires (both 1868). The new rules of October 9, 1867 changed the corner kick to a corner-throw-in while retaining the rouge rules (law 7) and determined that the older club chooses the jersey color. In the rules decided on 13th October 1868, the rouge was replaced by (now again) a corner kick or a goal kick (suggestion of Norfolk FC) (law 5), depending on which team sent the ball behind the goal (law 7). At the suggestion of Fir Vale FC and Norfolk FC, all mentions of the rouge flags were removed from the rules, but I do not know whether they also initiated the removal of the rouge rules. At the suggestion of Mechanics‘ FC, the goal became twice as wide (law 1), the permitted handling the ball at the Fair Catch was again included in the rules (law 12, previously 13) and umpires were now introduced, one elected per team, who supervised the match in the half of „his“ team (law 14). His decisions were final. On 21th October 1869, on Norfolk FC’s suggestion to the umpires, it was added that they were the only judges in the match – and only they – had the power to impose punishments (law 12, previously 14). Mackenzie FC wanted a whole new rule, reported the Sheffield and Rotherham Independent5)Cf. Sheffield Football Association. In: Sheffield and Rotherham Independent, 09.10.1869, p. 8.; but here it is not noted whether they also submitted a substantive change. Also another suggestion of the Norfolk FC was accepted: In a free kick, only the opponents had to take a distance of 18 ft from the ball and only 9 ft from the other players. In 1871 the Fair Catch was banned in the Sheffield FA as well as in the Football Association. Therefore, at the general meeting in Sheffield on October 10, 1871, deleted the definition of Fair Catch and replaced it by another handling game for „knocking on“, namely „handling“. Furthermore, it was determined that no attack from behind into the opponent is allowed (law 10) and that the throw-in player must not play the ball directly after his throw-in, but after another player had touched it (law 5). At the general meeting at the end of July 1875 many suggestions from member clubs, which were taken over into the rules: A goalpost instead of cord at the suggestion of a Mr. Hall (law 4), a flag or other signal for umpires at the suggestion of Sir John Charles Clegg (law 12), side change only at half time and after goals only kick-off from the centre by the opposing team (law 3), allowed handling by the goalkeeper (hold only) (law 8), that the ball would remain in play until the umpires whistled (law 12, also on Sir Clegg’s suggestion) and prohibited boots would lead to exclusion from the game without substitution until the footwear were in accordance with the rules was worn (law 11). In addition, it was decided that the clubs should be open to all persons and that they could be admitted to the Sheffield Football Association as soon as they were more than two years old. At the general meeting at the end of February 1876 the Football Association’s goal dimensions of 8 yd x 8 ft were adopted (law 1) and law 8 on goalkeepers and their permitted handling was reformulated: The goalkeeper need not be a predetermined player, but may change during the match. But he may never be more than one player of a team. They are allowed to hold, throw or strike the ball with their hand but may not carry it in the event of defending. The Sheffield FA continues to exist, but shortly before April 23, 1877, the Sheffield FA decided at a meeting to adopt the FA Rules.6)Cf. Sheffield FA Rules. In: Sheffield and Rotherham Independent, 23.04.1877, p. 7. The cover picture shows the report „Sheffield Football Association“ from the Sheffield Daily Telegraph of October 12, 1867, p. 10. Cite this article as: Petra Tabarelli: The development of the Sheffield Rules. In: Nachspielzeiten, 4. Juni 2018. URL: https://nachspielzeiten.de/the-development-of-the-sheffield-rules/ (zuletzt aufgerufen: 20. April 2019). 1. ↑ Cf. Sheffield Football Club. In: Sheffield Daily Telegraph, 31.01.1862, p. 2: „The most important alteration is the adoption of ‚rouges,'[!] which will have the effect of preventing matches to result in ‚draws‘.“. 2. ↑ Founded by parish Heeley Christchurch. Heeley is district of Sheffield. 3. ↑ ( Name in honor of Duke of Norfolk on whose land they played. 4. ↑ All other annual general meetings of the association until 1867 took place in this hotel. 5. ↑ Cf. Sheffield Football Association. In: Sheffield and Rotherham Independent, 09.10.1869, p. 8. 6. ↑ Cf. Sheffield FA Rules. In: Sheffield and Rotherham Independent, 23.04.1877, p. 7.